Who says audiophiles are not social creatures? Who says they hide themselves deep within the confines of their private man-caves and surface but rarely if only to pay their electricity bills? Nonsense I say! You should come visit us in Kaunas, Lithuania, and see and hear for yourself what amazing audiophile projects and opportunities to socialize abound. Recently, a local audiophile here hosted an intensive power cord shootout in his prime listening room. His room was custom built according to plans drawn up by our best acousticians, and was actually largely adhered to. The dimensions of the room are acoustically generous. After acoustical modeling with specialized software, repeated measurements were made during different phases of the building and installation process, to ensure that real-world results indeed follow. After all, models are but approximations. This exquisite listening chamber is some 6.5m wide, 10m long, and 5m high (21 ft. wide, 33 ft. long, 16.5 ft. high) in size. The side walls are not parallel, nor the front and back walls. The structural ceiling is actually some 1.5m above the acoustical ceiling one sees in the picture. The walls, too, are acoustically purpose-built structures built some 1m in from the actual carrying walls. It's really a venue for the top possible reproduction of comprehensible, intelligible and controlled sound, and a project indicative of just what is possible when unified spirit and passion drive the whole team of creators, including owner/initiator, architect, acousticians, and designers. The owner is a life-long audiophile who has gone through myriad changes to his systems throughout the years. In this one, he spent the past 10 years fine tuning the interplay between the various components. In addition to the obvious choosing of the components, two variables which gained special attention during this time were the equipment stands/feet as well as cabling. As in most audiophile systems, there is typically some equipment on the floor in front of the system rack set up for burn-in, trial and comparison. Here he's got some exotic one-off DACs in for trial. The never ending quest to seek ways in which to summon more and more revelation from recordings has always at its core the prerequisite of hearing not only different things, but better things, and this means choosing without haste. That is why, so often, such full-blown mature systems seem always to expand to, and sometimes even overtake, showroom status. Sometimes a more telling experience can be had in a private setting than even in an official showroom, where other factors of importance tend to dictate the experience rather than unadulterated performance alone. And it is just unadulterated performance that the audiophile really wants. After the glitz and glamor of the product's packaging has been put out of sight and the once enticing notions from it's advertising have been safely secured into purposefully inactivated portions of our memory, the real listening can begin! Cultivating this "out of sight, out of mind" state is probably one of the audiophile's central spiritual endeavors. When "the system disappears" we can again revel in that primal baby step we all once took: the one where for the first time we became self-less, if only for a second, marveling at the impossible achievement of balance. When "the system disappears," something within us disappears, though fleetingly, and allows boundaries to temporarily dissolve between us and the message carried by the music. Audiophile tools made available by designers to help us again and again achieve this fleeting state come in all sorts of packages and designs. Every man likes to take pride in his tools; to discuss their qualities with like-minded comrades and to socialize over their different traits and capabilities. Some tools achieve their function in an obvious assortment of situations. Some are highly specialized and are only fully appreciated in a specific context. 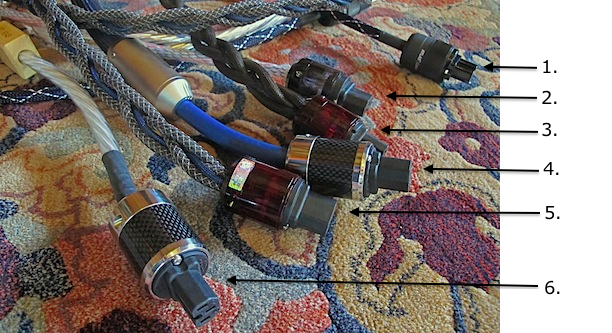 The power cord used in the audiophile context represents one of the more specialized tools, needed by few, understood by fewer, and cherished by the least. I am happy to cater to this rare breed of like-minded society, and am even more happy when opportunities arise such as the one described here. It's obvious that there is no stable price category framework to speak of here. This was not a test set up to fit any sort of publishing requirement. It was just personal engagement and another step towards learning something new through experience, and to share that experience and to compare notes about it with friends. Upon first listen of the DFPC Reference, without any burn in, the first impression was promising. It was decided to connect it somewhere to burn in for about four days without further listening for the time being. In the meantime, the Nordost Odin and Valhalla, the Siltech Ruby Double Crown, the Atlas Eos, and the DFPC Signature were already all burned in long before and had been part and parcel of this system for years. Their sonic characters were intimately known to the group, and recognizable on different pieces of gear throughout the system. After four days of burn-in, now in direct comparison with the DFPC Signature, the DFPC Reference was obviously superior. So superior, that it only took the first chord in the music to clearly tell. This opinion did not waver throughout the evening. After the next few days, what became apparent was that the DFPC Reference burns in differently than any other cable tried previously. It seems that even after 8-10 days, an unmistakable evolution in the sound quality was yet being perceived. Presumably this had to do with its very low noise floor. After this second, longer interval of burn-in, the comparisons began in earnest. First, special attention was given to draw comparisons between the DFPC Signature and the new DFPC Reference. It was found to represent a huge leap forward in terms of dynamics, lowered noise floor, and the fact that individual instruments seem to free themselves more than ever from one another. Using the DFPC Reference, it seemed initially that the sound was somewhat lighter in character, but it also revealed during the course of the evening to be still morphing into more colorful tonalities, even after the 2 weeks of burn-in already undergone. It was decided to keep burning it in for another few days before comparing to all the others. Also, this would give the local group time to organize the arrival of more audiophile listeners from Berlin, Riga, and Kiev. Finally, after three weeks of burn in, everyone felt that the performance of the DFPC Reference had settled. It was now time to compare to all the others. It was an unambiguous result: the DFPC Reference topped all the other cables. When the Odin was introduced, it seemed at first that its dynamic characteristics were better than those of the DFPC Reference, but through a steady coloration of those dynamics, it was found ultimately to be less organically musical and more harsh and irritating in sound. It was decided to keep the Odin in the system and give it a longer listen. Fatigue set in. Switching back to the DFPC Reference, the music now sounded more musical, had more color and emotional content. So it was decided that the DFPC Reference topped the list! On subsequent days, the DFPC Reference was tried on various pieces of equipment (DAC, CDP, amps), and it proved its excellence regardless of what gear it was powering. "If anybody you know would like to hear how the DFPC Reference sounds, they are welcome to come over for a comparison with the Odin, and they will find it sounds better than the Odin." For the price of one Nordost Odin we will gladly serve you with 12 units of the superlative DFPC Reference. 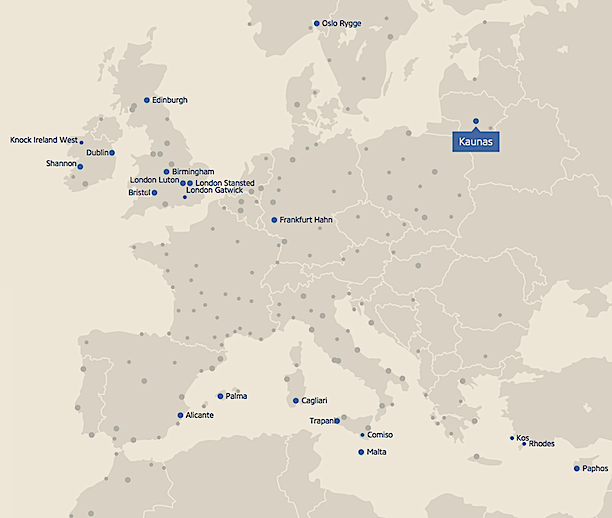 There are at least 20 direct low fare flights to Kaunas from within Europe. Ryanair regularly flies these direct routes for as little as 30 EUR. We can pick you up at the airport and be your guide around town for the day. Vilnius Airport is also close by. It's just an hour's drive by car. We can pick you up there, too. So come on over for a private listen some time. We can gladly demonstrate the DFPC Reference high performance power cord as well as the Tunnelbridge distortionless interconnect system.